This item cannot be shipped to MD. Every Farmina food is made with the best ingredients with the correct amounts of protein, fats, limited carbohydrates and advanced long life vitamins and minerals. The Natural & Delicious high protein, 20% Ancestral Grain formulas are comprised of 60% animal ingredients (pre-cooking weight), 20% organic spelt and organic oats and 20% vegetables, fruits, vitamins and minerals. These diets are also quite different from competing foods because they use better quality protein sources that are devoid of bone, so ash is as low as 6.80% and calcium and phosphorous levels are controlled. 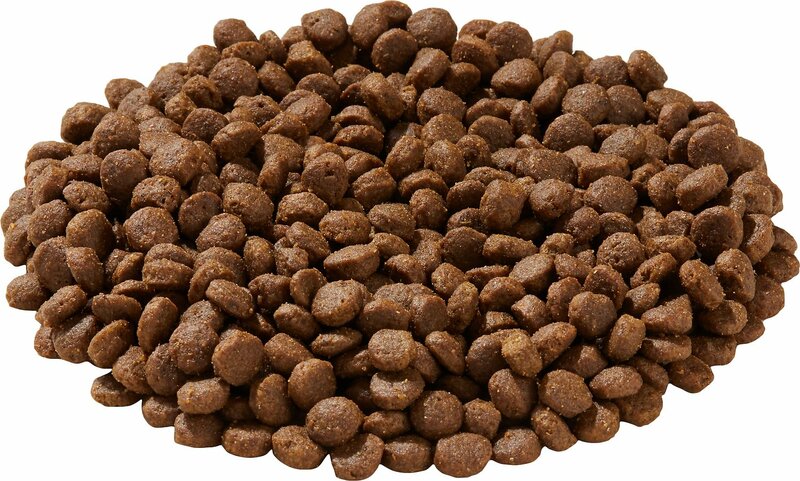 The #1 ingredient in this high protein, limited carbohydrate, and low fiber all life stage dog food is deboned chicken. It's been formulated for small and mini breeds with a smaller kibble size. 92% of protein is from quality animal sources which makes for a low ash content. Ingredients are also fresh and never frozen for optimum nutrition. It's a low glycemic formula so it's a great option for pets that need a food that won't spike blood sugar. This GMO-free formula doesn't contain peas, lentils, pea protein, chickpeas, or added plants oils. Natural omega fatty acids promote healthy skin and coat while added pomegranate and berries are rich in antioxidants to help fight free radicals. Actual weight listed on the bag is in kilograms. It is recommended to transition over a period of 10 days. Day 1-3: 25% Farmina mixed with 75% Old Food. Day 4-6: 50% Farmina mixed with 50% Old Food. Day 7-9: 75% Farmina mixed with 25% Old Food. Our terrier mix gets bored of foods easily. He’s picky. And I’m picky about what he eats. So when we both agree on a food, it’s a big deal at our house! This is a quality dog food AND he loves it! Win-Win! I researched this brand when I was looking to add back some grains to his diet. Love Chewy’s auto shop and selection! Please keep carrying this food! Good ingredients for my dogs. And they will eat it despite its odor. Just hoping it’s not spoiled as it truly smells bad! My senior Golden has some serious health issues and I do tend to cater to him. He had been happily eating another brand for several months, then suddenly didn't want it any more. I had bought a small bag of Farmina ND for such an occasion so when it happened, I just gave him the Farmina, he ate it, and seemed to enjoy it. I got the mini kibble size because he has lost several teeth and he likes the smaller size better, plus if he doesn't chew it, I don't worry. So we are good for a while anyhow. 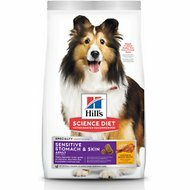 I decided to try this so that my rescue mini dog can have SOME but not a lot of grain in her diet. These days, it's hard to know what's OK/not OK. Craziness! I mix it with grain-free food. She likes it just fine. You can smell the difference! My very picky dogs (3) love this kibble. I have changed from grain free to low grain kibble to insure good health. This kibble can be difficult to get because it is made in Italy. Chewy does not carry the 15.5 pound bag but I just order multiple bags of the 5.5 bag and get the free shipping. 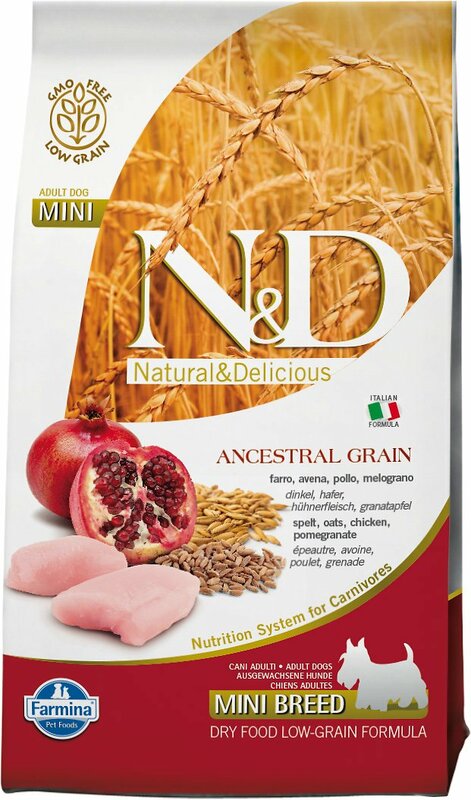 Following the recommendations of the FDA, I have switched my dog to a low grain dog food, Farmina Chicken and Ancestral Grain. The transition went smoothly & my pet appears to love it! In my search for a kibble, the picky dogs will enjoy I tried this brand. My pickiest eater eats it willingly, and that is a huge bonus since she often refuses to eat even liver treats.